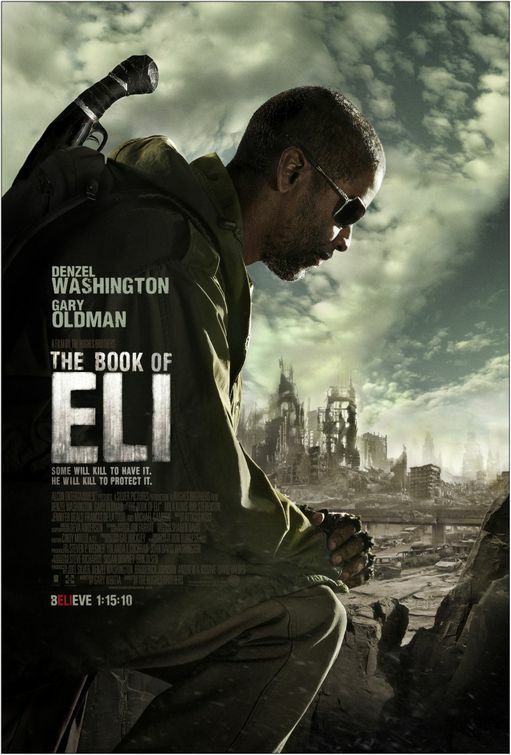 Eli (Denzel Washington), an expert hand-to-hand combatant nomad, is on a quest possessing the only copy of the bible believed to be left in the world, trudging over country suffering from an apocalyptic war 30 years previous and a "flash” caused by the sun that has burned virtually all of the landscape. Things go bad for our hero when he wanders into a town run by Carnegie (Gary Oldman) – a man persistently looking for a copy of the bible in order to use its words to manufacture a new population complete with blind faith. 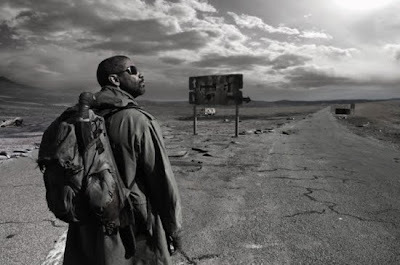 The Book of Eli is an obvious mixture of The Road and The Road Warrior, with a sprinkle of Children of Men, and while it ends up not being as impressive as any of those films, it still proves worth watching. That is, for an audience not looking to over think the feverish faith and religion storyline that drives it. Is it perfect fodder for a typical mainstream audience then? Sort of, but it mainly reaches for action fans and perhaps ones who can appreciate good art direction more than anyone else. To begin with though, the look of the film is a solid achievement. While the design of a virtual black and white ash covered post apocalyptic world is slowly becoming almost cliché in Hollywood of late, Eli still looks convincing with its barren deserts, spaghetti western-like towns and decaying bridges CGI. The Hughes brother's unique employ of the camera also helps generate an experience that at least feels fresh. Given the post-apocalypse sub-genre is well trodden ground, that's fairly applaudable, though there's no doubt the movie unfortunately suffers from style without substance too often. The script is good enough, with only few minor details ignored marring it from achieving a totally consistent reality (the source of water is a major plot point for example, but not so much fuel for any of the vehicles used to get around in). Plus much like The Road, not much time is given to the actual cause of this world either, but it stands by its conceptual rules well enough, however wafer thin. Adding to the atmosphere is a unique score which is a definite standout feature. It is thrust, almost overbearingly on our ears after the opening scene, announcing itself as almost a character in itself. A Vangelis-Blade Runner feel at first, it eventually moulds into its own futuristic sounding melancholy. Despite the noteable production design, exuberant violence and soundtrack however, it is the performances that keep you involved for most of Eli's running time – Denzel Washington and Gary Oldman are in good form. Though the British thespian is obviously tapping into characters such as his manic Stansfield in Leon (his Garnegie is a virtual, yet tamer retread), when it's Oldman, it matters little even if he's merely sleepwalking on screen. He is immensely watchable as usual. Washington is all frowns and (merciless) killing for most of the film, but his charisma and humour does shine through in some moments, making him feel slightly more rounded. As Eli's eventual trawling sidekick, Mila Kunis embodies the touch cookie attitude well, but still comes off too glamorous for someone who was apparently born into her current decaying environment. There are familiar faces in support and cameos too, with Tom Waits and Malcolm McDowell making brief appearances. I'm sure many Christians particularly who see this film will pick up on what it's actually trying to say under the surface (while cynics will have a field day), but for the most part, The Book of Eli boils down to a solid blockbuster, man-against-the-world type flick, complete with machete beheadings and clichéd scenarios. Most of its silliness is forgivable however, in a film that puts in a good effort of simple entertainment value. If you spend too much time mulling over the why's and how's of the script or scorning it for its clunky homages for example, you'll miss the good it has going for it, including a slightly unbelievable, yet true to concept ending that definitely caught me by surprise. Denzel fans who make the effort to catch it on the big screen probably won't be disappointed given the actor's more recent roles, everyone else however, should maybe wait for the eventual (no doubt spectacular looking) blu-ray.